For information about checking spelling in another language, see Check spelling and grammar in a different language. Mac: see Add words to your spell check dictionary in Word 2016 for Mac. Office Online: You cannot access spelling dictionaries using Office Online. If you have a desktop version of Office, you can click Open in [Program] to add or edit words in a spell check dictionary, or you can try or buy the latest version of Office. The spelling checker compares the words in your document against the main dictionary in Office. The main dictionary contains most common words, but it might not include certain proper names, technical terms, acronyms, or specialized capitalization. You can add words and special capitalization to a custom dictionary to prevent the spelling checker from flagging them as mistakes. 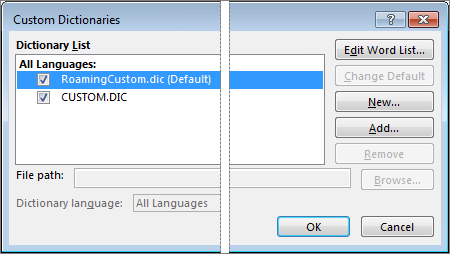 Important: Any custom dictionary setting that you change in one Office program affects all the other Office programs. All custom dictionaries are managed through the Custom Dictionaries dialog box, and any custom dictionaries you want to use must be enabled (selected) in this dialog box. Follow these steps to open the dialog box, and then choose a specific task below. In most Office programs: Click File > Options > Proofing. In Outlook: Click File > Options > Mail > Spelling and Autocorrect > Proofing. In InfoPath: Click Home > Spelling > Check Spelling Options. Make sure the Suggest from main dictionary only check box is cleared. All dictionaries are listed here, with the default dictionary at the top. Open the Custom Dictionaries dialog box by following the steps in the Open the Custom Dictionaries dialog box section, above. Select the dictionary that you want to edit. Make sure you don’t clear the check box. To add a word, type it in the Word(s) box, and then click Add. To delete a word, select it in the Dictionary box, and then click Delete. To edit a word, delete it, and then add it with the spelling you want. To remove all words, click Delete all. If you want this custom dictionary to be the default dictionary, where any new words you add will be saved, see Change the custom dictionary to which the spelling checker adds words. If the spell checker flags certain words as misspelled but you want it to ignore these words, you can add them to the default custom dictionary. (To change the default custom dictionary where these words are added, see Change the custom dictionary to which the spelling checker adds words). When checking spelling and grammar automatically, right-click the word with the red squiggly line, and then click Add to Dictionary. When running the spelling and grammar checking tool, click Add or Add to Dictionary for the flagged word. Note: If the Add to Dictionary option is not available, make sure you have a default custom dictionary selected in the Custom Dictionaries dialog box. See Change the custom dictionary to which the spelling checker adds words to learn how to select a default custom dictionary. To learn more, see Check spelling and grammar. In the File name box, type a name for the custom dictionary. If you want the new dictionary to be used for another language, while the new dictionary is still selected in the Dictionary List, select the language on the Dictionary language menu. If you want your new custom dictionary to be the default dictionary, where any words you add will be saved, see the next task, Change the custom dictionary to which the spelling checker adds words. To change the default dictionary for all languages, click the dictionary name under All Languages. To change the default dictionary for a particular language, click the dictionary name under the language heading. Note: If there is only one dictionary under a heading, it must be the default dictionary. In this case, the button isn’t available. The next time that you check spelling, the program uses the default custom dictionaries that you selected. By default, when you create a new custom dictionary, the program sets the dictionary to All Languages, which means that the dictionary is used when you check the spelling of text in any language. However, you can associate a custom dictionary with a particular language so that the program uses the dictionary only when you check the spelling of text in a particular language. In the Dictionary list box, click the dictionary that you want to change. On the Dictionary language menu, click the language for which the dictionary should be used. 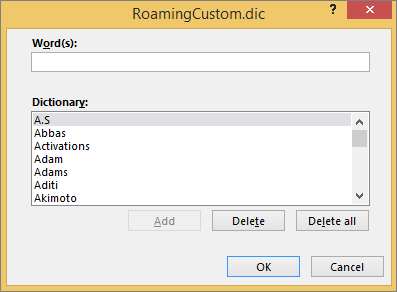 The Custom Dictionaries dialog box lists the available custom dictionaries the program can use to check spelling. If the dictionary you want to use, such as one purchased from a third-party company, is installed on your computer but not listed in the Dictionary list box, you can add it. Locate the folder containing the custom dictionary you want, and then double-click the dictionary file.